Drag harrows (often referred to as chain harrows, spike harrows or spring-toothed harrows) were once widely used in connection with the planting of many different crops. Today, they are rarely used in connection with growing row crops or horticultural crops, but still have a place on many livestock farms. 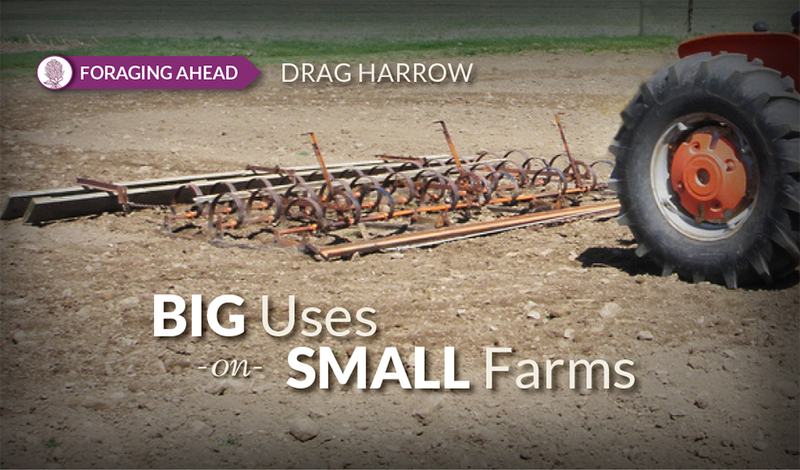 On small farms, drag harrows are often pulled by ATVs rather than tractors. Drag harrows are not complicated. They have no wheels, bearings, or hydraulics, and are simply pulled behind a tractor or other vehicle. Most are made of interlinked high-tensile strength rods, and have teeth on one or both sides. The construction of most models allows great flexibility, so the equipment adjusts to the undulations of the land over which it is being pulled. Depending on the model, which side is down, and which direction it is being pulled, the amount of soil disturbance that results from use of this piece of equipment can vary considerably. A drag harrow can be used to scatter manure piles, a useful technique for improved distribution of recycled nutrients and hastened degradation of manure. This task also reduces the number of internal parasite eggs and larvae, due to exposure to the sun. However, it is debatable as to whether these benefits are great enough to justify the time and expense involved, especially given the present cost of fuel. Selected areas in which there is an unusually large amount of accumulated manure could be exceptions. It is easier to justify the use of a drag harrow when broadcasting seed on an established perennial grass pasture. This technique works well when white clover, red clover, or annual lespedeza seed is being broadcast seeded in late winter/early spring on a closely-grazed tall fescue pasture. This also works well when establishing an annual legume and/or annual ryegrass on closely-grazed dormant bermudagrass or bahiagrass in autumn. Drilling seed is usually a more dependable way to obtain a forage stand than broadcasting seed. Furthermore, light tillage with a disc harrow (which has circular blades capable of substantial soil disturbance) is usually more effective in obtaining a forage stand than use of a drag harrow. Nonetheless, using a drag harrow simultaneously with broadcasting seed, or broadcasting seed and using a drag harrow immediately thereafter, can result in better seed/soil contact and greater likelihood of a stand than drilling alone. In some situations, a drag harrow can be used to encourage seed germination and establishment of annual seed already present in a field. This includes areas where autumn disturbance of a warm-season grass sod favors germination and establishment of annual clovers or annual ryegrass. It also can be used on some farms in late winter/early spring to favor establishment of crabgrass to complement the growth of tall fescue. A drag harrow can also be used in connection with establishment of many forage crops on a prepared seedbed. It can be used in tandem with a disc harrow to help pulverize and smooth the soil, or used on land where seed has been broadcast so that it will be scattered and/or covered with a thin layer of soil. The drag harrow is not a sophisticated tool, but it is relatively inexpensive, easy to use, and can provide excellent benefits on many forage/livestock farms.